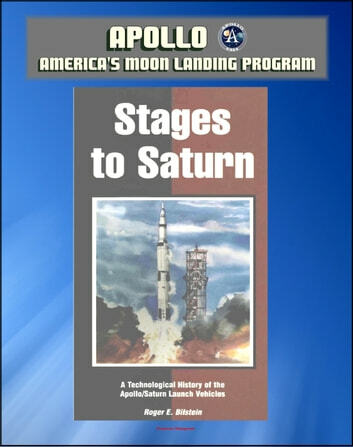 This official NASA history document - converted for accurate flowing-text e-book format reproduction - is a classic study of the development of the Saturn launch vehicle that took Americans to the Moon in the 1960s. Stages to Saturn is one of the finest official histories ever produced. It is essential reading for anyone seeking to understand the development of space flight in America, and the course of modern technology. The Saturn rocket was developed as a means of accomplishing President John F. Kennedy's 1961 commitment for the United States to reach the Moon before the end of the decade. Without the Saturn V rocket, with its capability to send as payload the Apollo Command and Lunar Modules — along with support equipment and three astronauts — more than a quarter of a million miles from Earth, Kennedy's goal would have been unrealizable. Stages to Saturn not only tells the important story of the development of the Saturn rocket, and the people who designed and built it, but also recounts the stirring exploits of its operational life from orbital missions around Earth testing Apollo equipment to the Moon and back. The preface states: The decision to treat the history of the Saturn program as a technological narrative shaped the nature of all sections of the book. So that some of the innovations and advances might be appreciated, it seemed advisable to include a brief historical overview of rocket technology. Against this background, I hope the Saturn story will stand out with greater clarity. The narrative itself is organized into seven parts. The question was how to deal with the complexity of many simultaneous programs during the Saturn development that involved the various engines, stages, and associated equipment for three separate launch vehicles. A strict chronological organization seemed unnecessarily confusing. The topical approach, although constructed in a loose chronological sequence, provided the opportunity to deal with the early technology involved in Saturn 1 and Saturn 1B launch vehicles primarily in terms of the concept of clustering tanks and engines. The engines themselves, although they possessed inherent differences, evolved out of common principles of engine design and cryogenic technology. Dealing with these propulsion systems as a separate unit made the significance of their development stand out more clearly. Similarly, I analyzed the evolution of rocket stages as a unit and emphasized propellant tankage for the Saturn V vehicle. Although many early Saturn flights were concurrent with the research and development phases, all the launches are summarized in two chapters toward the end of the book. Just as the flights were the culmination of Apollo-Saturn, discussion of them all at the end of the narrative seemed logical."